Science-fiction and fantasy fans first got to know Felicia Day from the last season of Buffy The Vampire Slayer, when she played Vi, one of Buffy's army of potential Slayers. Since making her name in fandom with that role, Day has starred in the films Bring It On Again and June, appeared as a patient on a recent episode of House, and starred in a well-known Cheetos ad. But instead of waiting for parts to come to her, last year Day launched a web series on YouTube—The Guild, a comedy about World Of Warcraft addicts based on her own obsession with the massively multiplayer online game. Her experience in Internet video led her to Joss Whedon's cult-hit web show, Dr. Horrible's Sing-Along Blog, where she starred in a romantic triangle with Neil Patrick Harris and Nathan Fillion. Recently, Day spoke with The A.V. Club about making an online serial on a shoestring, growing up as a home-schooled nerd, and what it was like singing a videogame theme song to a crowd of 5,000 geeks. The A.V. Club: Before you made The Guild, you were addicted to World Of Warcraft. How bad was your addiction? 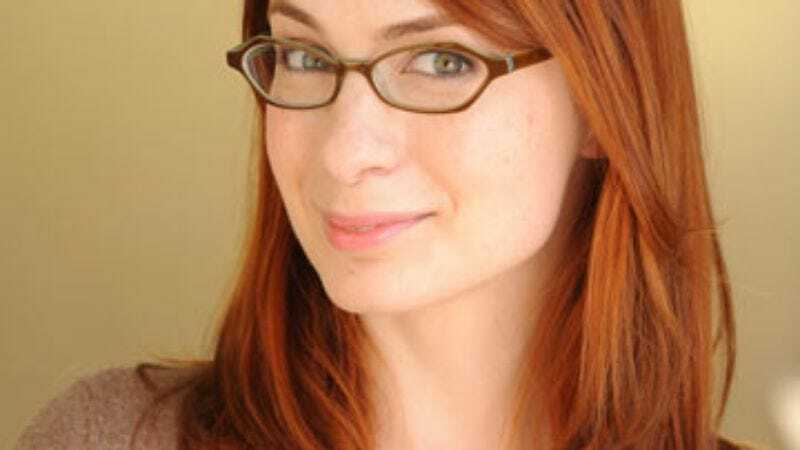 Felicia Day: You know, even on anybody's relative scale, it was probably really bad. I would go to sleep thinking about playing, I would wake up and immediately have a plan for playing, sometimes I had a to-do list for playing. And I would schedule my week around my raids at night, and then I would schedule my farming during the day. In World Of Warcraft, you can see how many days you've spent online. I think mine's in the months. AVC: And you joined a guild in the game? FD: I think that's the addictive thing. I love playing single-player [role-playing games]. I've played pretty much every single-player RPG there is, has been, ever will be. But as far as the MMOs go, especially with the voice chat, it becomes like hanging out with your friends in a chat channel, and you're playing at the same time. So it becomes a lot more social than people would probably think. You get to know these people better than people you know in real life. Because there's just a lot more downtime. When you schedule a lunch with somebody, you're on point, you have an agenda, and you have two hours with that person. But if you see somebody six hours a night… [Laughs.] You generally learn a lot more about their lives than you would under normal circumstances. AVC: It's interesting that you pitched The Guild as a sitcom. The stereotypical sitcom now is like five or six friends who hang out in a bar together, and the chance for dysfunction with something like an online game is so much greater. On The Guild, there's something seriously wrong with each character in one way or the other. FD: I agree. I mean, I love sitcoms, and I grew up on sitcoms. That's my tasty junk food. So I wanted to create a sitcom and have some really quirky characters, because most of the stuff they make now is just so marginalized. How interesting is a white guy who's 28 years old and lives in New York? What story have we not seen about a character like that? Just as a writer, it's so much easier to come up with comedy when you have a really oppressed Indian boy. [Laughs.] Or a mother who is an addict but still has to take care of her kids. When I sent [The Guild] out as a spec, people were like, "This is kind of interesting. It's funny. I don't understand half of it, because of the gaming. And it's way too niche. You can't cater to an audience like that." And when I wrote it, it was like, beginning of 2007, so the idea of people online-gaming together was even more foreign then. My producing partner, Kim Evey, read the script and she was like, "Wow, we should do this for the web, because that's where the people you're writing about are." She had a viral hit at the time called Gorgeous Tiny Chicken Machine Show, which she subsequently has done with Sony Online. But her first series, she just did it in her backyard, in her garage, and it got millions of hits, because they got passed around. So she definitely came up with more of the push to put it online. Because I didn't know what else to do with it. There are a lot of web series online, especially in the last six months, and I think Hollywood has had their toe dipped into it and released a lot of web series. Most of them haven't done very well, to be honest, because the space is kind of unique to what they know how to do well. And I think that we are very successful, especially having no PR, completely low-budget, funded by fans—I mean, basically we shot [season one] on fan donations. AVC: How did you make that decision, and make that leap into putting up your own money and your own time? FD: I think that the only reason I actually did it—I've been an Internet girl all my life. I've always been on the Internet. Even when you had dial-up, and you didn't even have the Internet, you had CompuServe and Prodigy… My parents were very tech-savvy, so I was weaned on that from a young age. We had a laptop that my grandpa had handed down, because he was a nuclear physicist, so he was always a techno-nerd. The screen was probably five inches across, and it was green type on a black background. I was like, "What is this MS-DOS thing?" I've been trying to communicate with other people online all my life, because I was home-schooled, so I moved around. And that was pretty much my social life. That's how I grew up, meeting people and just expressing myself and socializing through the Web. AVC: You were an Army brat? FD: My dad was in the military, yeah. He was in the Air Force, and he was a doctor, so he would go places for six months here, and two years there. And I was home-schooled because I played the violin, and I did a lot of competitions. AVC: You were home-schooled to give you the schedule you needed to do the violin practice? FD: Yeah. And ballet and stuff. My mom wanted me to be a geisha, I guess, [Laughs.] So I had opera lessons, and ballet lessons, and all sorts of lessons. It was cool. I liked it. I would be reluctant to put another kid in school, because I had such a cool hippie background. FD: Well, we lived on military bases, but we would sleep until 10, 11. I'd have an agenda, and I'd do an hour of schoolwork, and I'd watch Lost In Space. [Laughs.] So, it was definitely an unstructured childhood. AVC: What led your mom to want you to get into performance? FD: I think all of this stems from her inability to do those things. I guess you have these things you want your kids to do that you couldn't do, and you have to start early to do them. And I actually had a weird ligament in my thumb that made my thumb crooked, a little bit. And for some reason, she somehow leapt to the violin, because when you put your thumb around the violin, it's kind of crooked, and so she thought, "That's an advantage." She started me at like 3 years old because she saw something on a talk show about the Suzuki method. And I just happen to be really good at it, and I was intense then, and I'm intense now, and I would just practice, even though I was really, really young. And then the ballet was because my mom is very clumsy. And then theater came about because that was one of the things I could do wherever I moved, just be in the chorus somewhere, just as a social outlet for me as a kid. So basically my socialization as a child didn't come from any schooling, it came from being in theater, and meeting people online. AVC: With all the things you do, do you play violin now? FD: I don't play very much, because I just don't have time. Doing this web show—people underestimate what it takes to do a web show successfully. They underestimate the amount of work that you have to do to get it to your audience after it's made. I think you have to work so much harder, especially if you don't have a huge budget. You have to know how to get your audience engaged, because the Internet is so distracting, and there are so many choices. People, even if they love your show, will forget to go back for episode four, because you know, people are busy. It's not just because I was an actress with a little bit of a name that my show had so many hits. And it's not just because we have a specific demographic. There are millions of people who play World Of Warcraft who haven't seen my show. So it's just a question of reaching out and finding the audience, and I think that the strength of the popularity of our show is that we try to involve our audience in making the show, and spreading the word about it. Because we are just completely grassroots. AVC: You're selling the DVD now—are you planning any other merch, or any other revenue streams besides fan donations? FD: We've self-funded the first couple episodes, and then we put a PayPal button up on a lark, from the suggestion of somebody we took a meeting with. And I didn't expect anything. And then we suddenly, after three weeks, got enough to shoot another weekend. So that was cool! And then it just got more and more popular. I'm not saying that we made a lot of money off it. I personally haven't made money off the show, and my producer hasn't made money off the show. Every dollar that we've made has gone back into the show. AVC: Anyone can buy a camcorder and start a vlog, but you've had industry experience, and you've been on real sets of films and movies. Do you feel like that makes it easier to do what you're doing? AVC: What advice would you give a newcomer who wanted to make a web video series? FD: Number one, you need to have a script that you think is really funny, and it's true to yourself. I think some people use things as a stepping stone, and they want to please people and show them, "Hey, I can do hip guys in Judd Apatow style," and it's not true to them. If there's something you know about, like motorcycles, do something about motorcycles first. Do something that's really true to yourself and find a voice, and make the script as good as possible. And then there are a lot of resources, like Indy Mogul, there are other web videos about how to do low-budget filmmaking, and behind-the-scenes stuff. Just do your homework, and see how to make the actual short as good as you can. And then after that, think about just from a practical level, "If I wanted to watch this video, what kind of person would I be, and how would I find it?" The Guild came about because I would—I picked a bunch of blogs I personally as a videogamer frequented, and I just cold e-mailed people, and I was like, "Hey. My name is Felicia. I have a show that I just made, and here it is!" AVC: You got involved with Dr. Horrible because you were talking to Joss Whedon on the strike line, and started talking about web content? FD: Yeah, he had a Mutant Enemy day—he was just out striking all the time, and he had a day where he asked some of the actors who work on his shows to come out and march. And of course I'm always giving out cards—"Have you seen my show? "—and he is on my e-mailing list, and he said, "Yes, of course I've seen it!" He really liked The Guild, and he pitched me—he was like, "Yeah, I've been thinking about doing this Internet short about a supervillain. And it's a musical. With a blog." And I was like, "What? That sounds awesome!" And then I just forgot about it, and three months later, he sends me this cold e-mail, "Hey, can you sing? —J." Just out of the blue. Of course, any time Joss asks you to do anything, you're like, "Yes, I don't care what it is, yes. It's going to be fun and awesome." And that's how I got involved with it. So thank goodness for my mom making me take singing lessons. AVC: You attended the Penny Arcade Expo this year, promoting The Guild and singing "Still Alive" [the theme song to the game Portal] with Jonathan Coulton. What was that like? FD: Oh man, it was terrifying and awesome at the same time! I mean, singing in front of a live audience? That was the first time I've ever done that, other than in a musical theatre, where I had a character in front of me. I was very nervous. I'm always doing things that scare me, because I feel like that's how you should live life. If I'm terrified—and I'm often terrified—then I should be doing that. Like trapeze class, or singing in front of 5,000 people. So that was pretty awesome. Walking through Penny Arcade, literally I couldn't go five feet without somebody recognizing me from either Dr. Horrible or The Guild. AVC: Are you a shy person, or is this starting to become natural? FD: I'm very shy. I hate parties. I don't go to parties. If it's a Friday night and it's after 10 p.m.—"I'm actually not going to be able to come to that party." Because I don't go out after 10 p.m. [Laughs.] I'm totally serious. I'll play videogames until 1 a.m., but I'm not going out of my house. But yeah—I wouldn't want to be Julia Roberts, where it happens everywhere you go. Because I can imagine that it's completely overwhelming. But the cool thing about what I'm doing, I feel, is that with the Internet, I do my Twitter and I have a blog, and I personally answer as many e-mails as I can, and thank people. I'm going to be on House next week, and people are like, "Oh my gosh, Felicia's on House!" And it's almost as if I'm their cousin, or just a friend or a neighbor who did that. Vs. some famous person. AVC: It's someone they're invested in, who's in their world, as opposed to someone who was thrust on them by movie posters. FD: Or you know, completely separated and become something you project all these things on. Like, "Oh, that person's like this." Well, they know how I am. They probably know what I had for breakfast that morning. [Laughs.] And that's the cool part. And I respond to people, if they post on my blog, I'm like, "Oh, that's really cool you read that book, that fantasy series!" It's almost like they're my friends in a sense. There's less separation. They know me more as a human being with my flaws, versus some kind of actor on a pedestal. AVC: Is it true you're writing a machinima series for Machinima.com? FD: Yes I am. I'm writing a sitcom set in a gaming world. And we're actually interviewing directors, and that's going to get started pretty soon, hopefully. So I'm excited about it. I wanted to write a series—either sci-fi or fantasy—and obviously the budgets on those are crazy. And doing a sitcom set in one is insane. So Machinima, I had a concept, and I pitched it, and they just loved it. They liked it, and so I'm able to do a really cool sci-fi/fantasy sitcom, which would never, ever, ever happen otherwise. AVC: Have you ever considered writing for games? FD: I would love to write for games. That would be pretty cool. Nobody's approached me. I've also thought about doing graphic-novel stuff. And I'm a fantasy addict—I've read every single fantasy novel that exists, probably—so one day I'd like to do that too. It's all on a list somewhere, but honestly, The Guild is six hours of my day, and when I have a free moment, I do want to spend it with my boyfriend, or my computer games. In that order.